Belinda was one of CrossKennan Lane Animal Sanctuary (CLAS)’s special rescues. Belinda was very unique. She was a cheeky little bird, who possessed a very calm, gentle personality. Belinda was the kind of bird that was always intrigued by her surroundings---always wanting to investigate and explore. She absolutely adored to be in the company of people---and would be perfectly content to sit a person’s lap or perch on their hand, arm or shoulder for hours at a time. Belinda enjoyed to be ‘pet’ by humans, and would even push her head into a person’s hand or chest as a means of communicating that she wanted to be petted. However, funny enough, Belinda did not actually like to be held or cuddled. This is because she did not like to feel restrained, and wherever she choose to perch had to be somewhere where she felt in control. 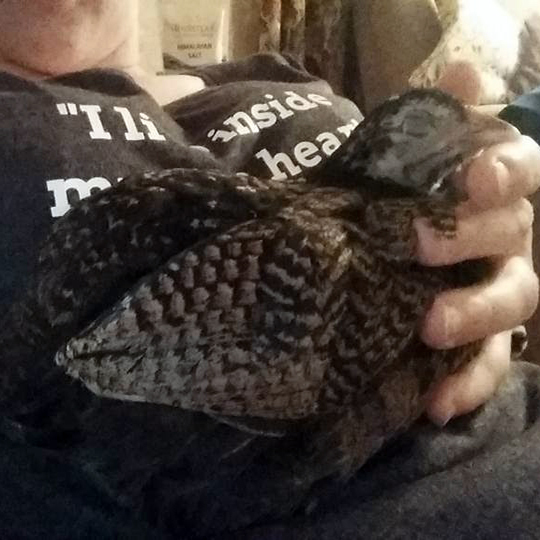 Belinda hatched from one of 12 eggs that an abandoned hen was sitting on, one cold evening in November 2015. 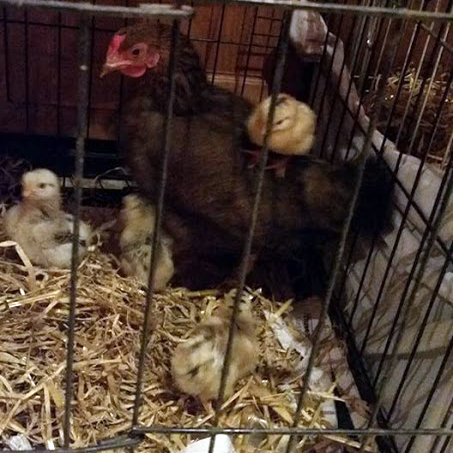 The mother hen, and her eggs, had been left in a small cardboard box at the Sanctuary’s front gate. A total of three of the eggs hatched. As the chicks grew in size, CLAS began to notice how one of the chicks (who was also the smallest of the three) was frequently bullied by her siblings, as well as her mother. With each passing day, the bulling rate increased, so much so that CLAS was worried that the chick would get hurt or possibly killed if she was left with the others. This chick was named Belinda. 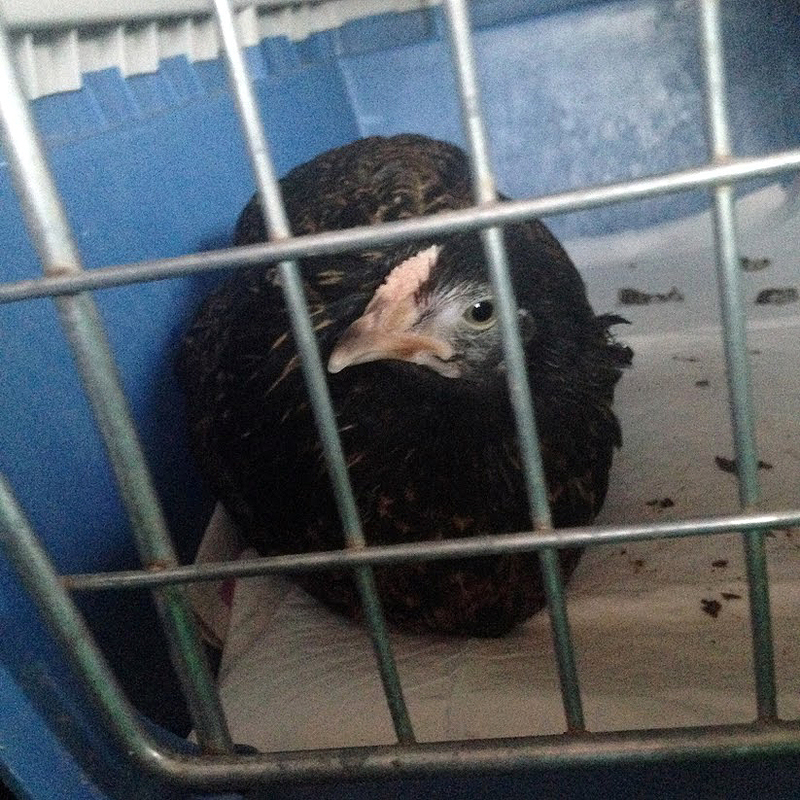 Belinda was relocated inside, to be raised as a house chicken. 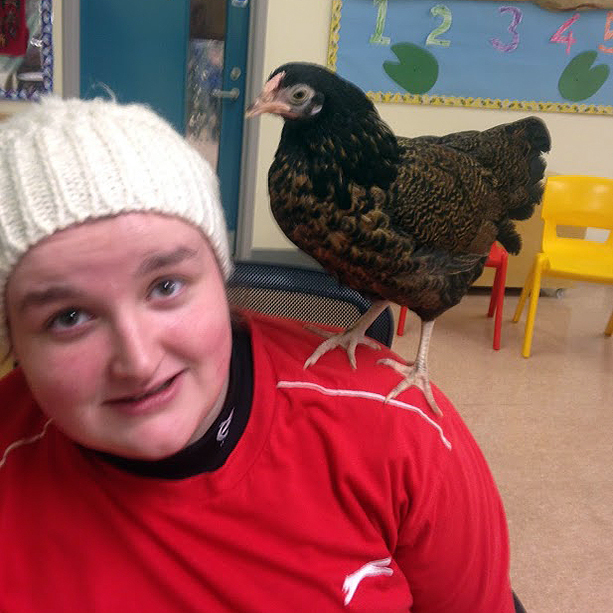 CLAS already had one house chicken---an 11-year-old therapy hen named Mrs. Leghorn, who was also a previous CLAS rescue. CLAS was hoping that Mrs. Leghorn would take Belinda in ‘under her wing’ so to speak, and serve as a sort of mentor. However, there was some initial housing drama between the two birds. Although the two hens seemed to get along together during the day, at night they were separated from one another; for Mrs. Leghorn would unfortunately also pick on Belinda. During the daytime, when the two weren’t at a therapy session, they were given access to forage outside in the garden in the backyard. Chickens are actually one of several animal species that are collectively known for their use for Animal-Assisted Therapies (AAT). Other animals include dolphins, horses, dogs, and recently cats. AAT has been shown to be really beneficial for enhancing an individual’s quality of life and/or rehabilitation in a variety of settings, such as nursing homes, special needs schools, rehab centers, and at home. NURSING HOMES: There is documented evidence that chicken therapy can help improve the health and wellbeing of the elderly by helping with dementia, reducing depression, loneliness, and reduction of the use of anti-psychotic medication. 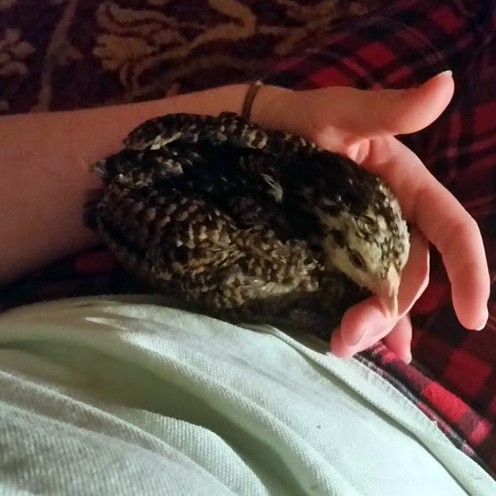 Chicken therapy helps them gain a sense of purpose and being part of something special. Therapy ranges from periodic interaction with chickens to being involved in the day-to-day care of the flock. Over the past several years, there has been an increased number of facilities worldwide that are implementing chicken therapy programs for their residents. 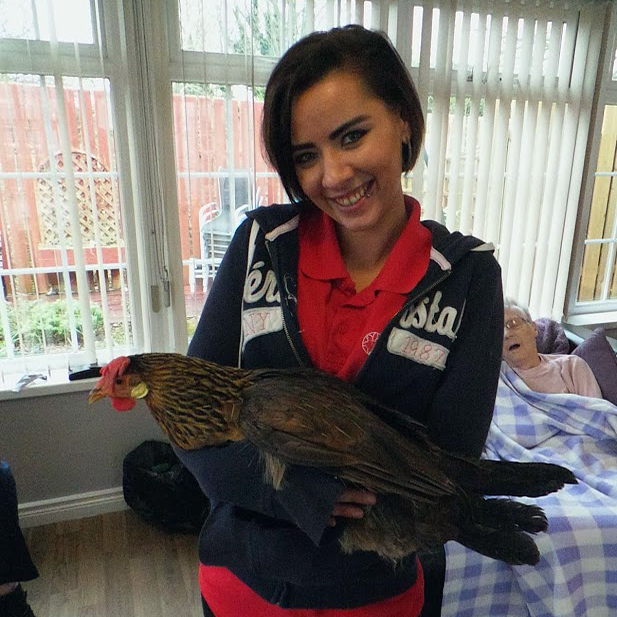 In 2011, the charity Equal Arts introduced the HenPower program to the 700+ residents of a nursing home development in northeast England. Today, the program has been implemented in more than 40 care homes in northeast England and New South Wales, Australia. The participant members of the program are called ‘the Hensioners'. The Life Care Center (LCC) of Nashoba County in Littleton, MA, started a chicken therapy program for their residents with dementia in 2013. The chickens were named after the resident’s mothers and grandmothers. 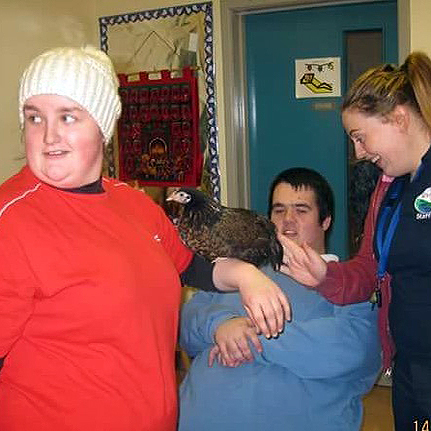 SPECIAL NEEDS SCHOOLS: Special needs children, such as those with Autism Spectrum Disorder (ASD), Down Syndrome, Motor neuron, and Cerebral palsy, have been found to show great benefit from interacting with, caring for, and bonding with chickens. The chickens help provide social support, desire to talk about their stories and experiences with the animals, gain trust, build confidence, make contact, accomplish behavioral changes and conquer fear. 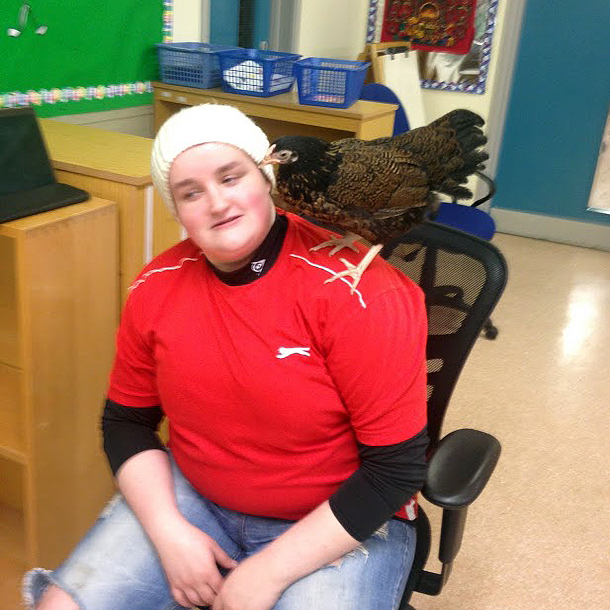 Frightful is Andrew, a young boy with autism’s pet chicken and best friend. By observing her son’s relationship with Frightful, Kristin Adams, Andrew’s mother, was able to better understand her son. Frightful saved their family. In Tanzania, the community implemented a new ‘Chicken-Raising Project’ at special needs learning centers for children with Down Syndrome. The students of the center take turns caring for the chickens, collecting the eggs, and learning business skills by selling the eggs in the market. Gwenne Baile brings Rosebud, a certified therapy chicken, with her on session visits to the Mount Laurel Center for Rehabilitation and Healthcare in New Jersey once a week. The residents at the rehab center enjoy interacting with her and sharing their chicken stories from their past experiences. 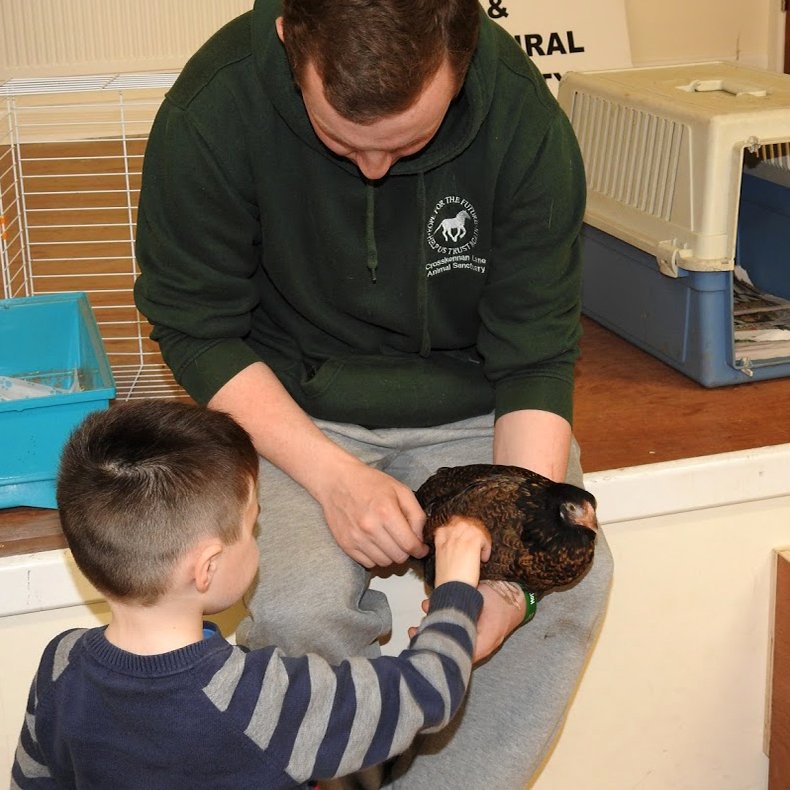 Darla, a rescued Silkie chicken, is a therapy chicken to seven-year-old Finn Proctor. 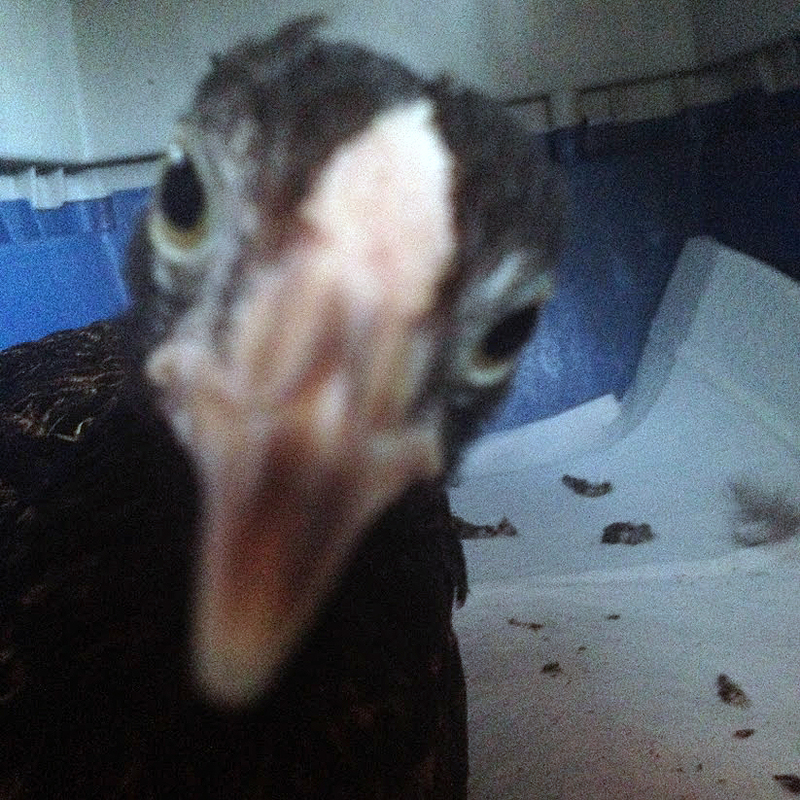 Since rescuing her, the entire family has completely changed their perception about chickens, and are now vegetarians and advocates for promotion of compassionate care of farm animals. The University of Minnesota started the PAWS (Pet Away Worry & Stress) Program to help their students with stress. 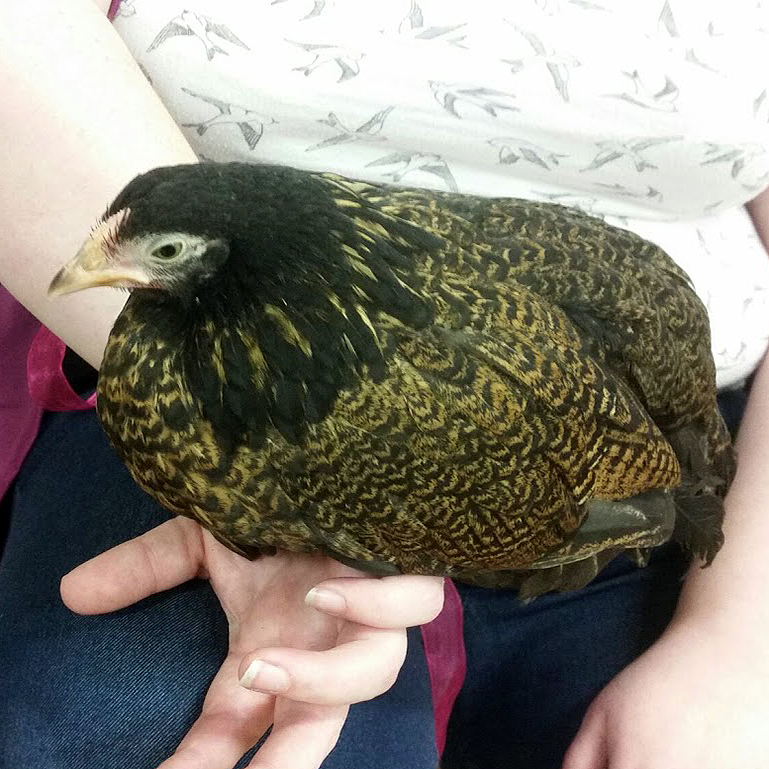 The program provides students and other members of the University community the opportunity to interact with several therapy animals---one of which includes Tilly the hen. Belinda started training for therapy work when she was six months of age. She frequently visited nursing homes, day centers, and special schools for children. However, it was not always easy for CLAS to get permission to bring Belinda to these institutions. The Sanctuary often received mixed responses when they booked a therapy session visit with the hens. Some people were very against it, and didn’t want the birds in the buildings. However, an overwhelming majority of the people who agreed to try the hen therapy, were really happy with it and wanted them as regular visitors. CLAS would regularly bring Belinda and Mrs. Leghorn to therapy sessions at nursing homes, day centers, and special schools for children. 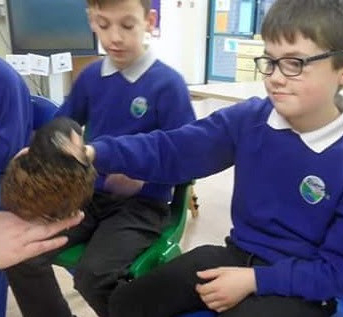 Although all parties showed great benefit from working with the therapy hens, CLAS found that it was particularly helpful for dementia patients. At one of the nursing homes that CLAS and the therapy hens regularly visited, there was a man who the staff said would never speak and spent every day lying across a sofa watching television. During each therapy session at the nursing home, CLAS noticed how this man would regularly glance over at the hens. One particular session, CLAS brought Belinda over to the man. Although he did not want to touch or hold her, he did sit up and start to speak. He didn’t make a lot of sense at first, but after a while, he started talking about different breeds of chickens and asking CLAS questions about Belinda and what her breed was. The staff at the nursing home were shocked. CrossKennan Lane Animal Sanctuary (CLAS) is a registered charity situated close to Antrim in Northern Ireland. The sanctuary has been a registered charity since 1996. It is the only welfare and rescue organization for horses and ponies in Northern Ireland. In addition to horses, CLAS also rescues other animals in need, such as rabbits, chickens, dogs, cats, and other farm animals. Besides rescuing animals, they also promote animal welfare and education through the province. Hensioners and the power of therapy animals. The Feed. Feb 2016. 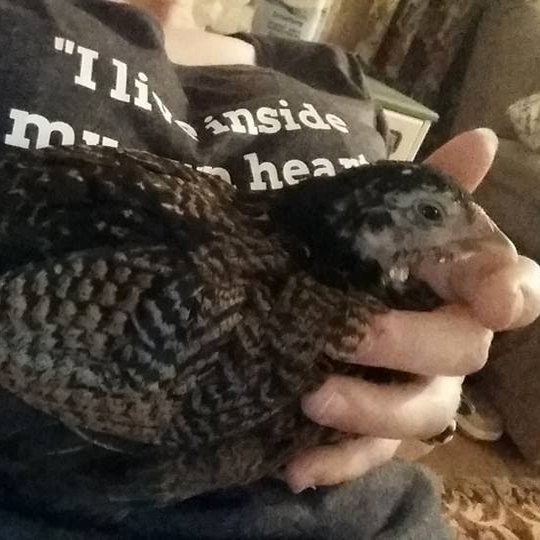 Adams, K. How a pet chicken helped me understand my autistic son. The Washington Post. Feb 2017. McKenzie, Joe-Marie. 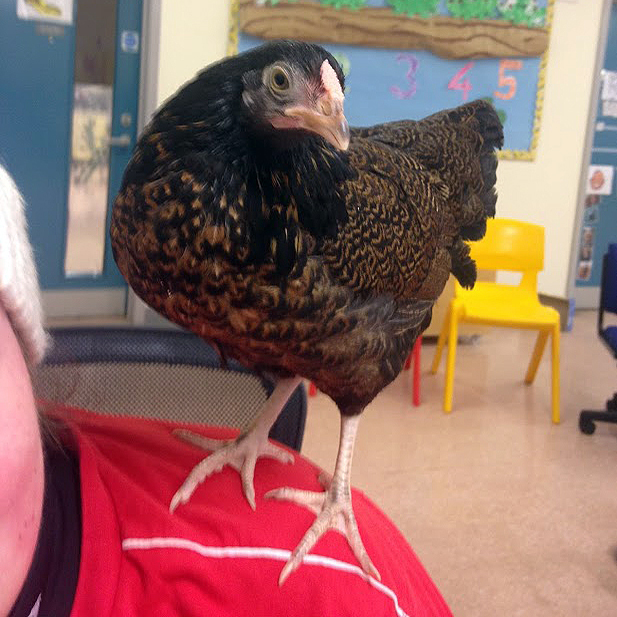 Meet Darla, the therapy chicken helping to educate her community. ABC News. Feb 2017. K Schmitt. Woodstock the therapy chicken dies at 10. Minnesota Daily. September 2016. C Whittaker. 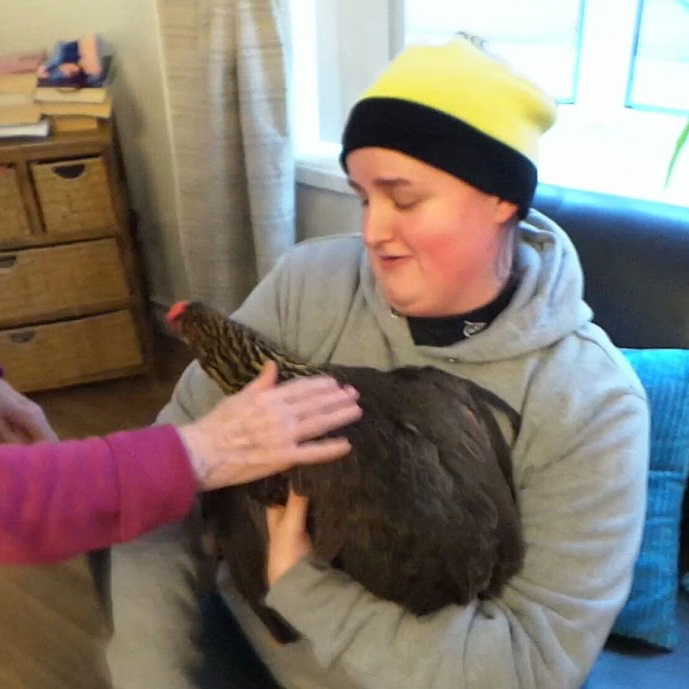 Residents don’t chicken out as therapy hen visits. Courier-Post. October 2016. 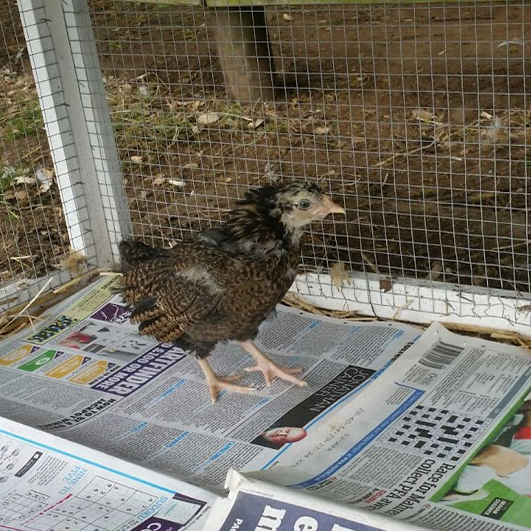 George, S. Hen-keeping – a cracking new therapy for older people. The Guardian. July 2015. M Hussey. Samuel, the Chickens, and World Down Syndrome Day. Mosaic International. March 2014. D Meghan. Chicken Therapy: A New Way to Help Alzheimer’s Patients. Care2. July 2013. O’Haire, Marguerite E. "Animal-assisted intervention for autism spectrum disorder: A systematic literature review." Journal of autism and developmental disorders. 2013.